You are currently browsing the tag archive for the ‘ripoff’ tag. Do Not Go To Concerts At Allentown Fair – Here’s Why. This review isn’t about the show; at least, what I saw of it. Rush always rocks and they’re my favorite band. However, this is the first Rush show in 20 years of seeing them where I didn’t have a view of Neil Peart. Unless you count the times they showed him on the video screen. When I purchased tickets to this show, I got third row in section A, which was the reserved-seating ground section furthest to the right. The seating chart didn’t show the stage, so I went ahead on faith that TicketMaster was indeed giving me the best seats available. They didn’t. We arrived at the venue and were amazed to find that our seats were nowhere near the stage. 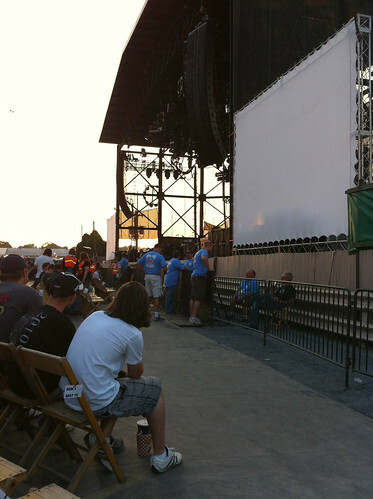 We were at least 30 yards away from stage left’s edge and were at such a bad angle we could just see Geddy and Alex. Neil’s drumkit and the video screen behind him were completely blocked from our view. From my point of view, the Allentown Fair and TicketMaster conspired to rip me off. Everyone around me felt the same way. It was shameful to charge us the highest ticket price for seats that were worse than the general admission grandstand. I won’t be coming back to this venue and I’m going to recommend against patronizing the Allentown Fair. I could say more, but I think I’ve made my point. Don’t patronize the Allentown Fair. They are ripoff artists just like TicketMaster. Rush, please don’t play there ever again. Update (9/2): The only place I see for TM reviews to be filed is under the band, not the venue. (How very convenient.) The reviews for Rush are here. My review was submitted last night (9/1) and it’s not there yet. There are several other low-star reviews of the show submitted yesterday, but none criticizes the venue as much as mine did. It was probably declined by the site admin. Thanks for the comments so far.